Learn the core foundations for brands that stand out. Dreaming of that kind of brand? It starts at the core. And it can happen for you. I'm breaking it down in over 25 pages of approachable content and actionable steps in this jam packed guide and workbook. This guide will help you understand the core foundations you need to grow your brand, increase visibility, and make an impact through your business. Ever wonder why some brands just have that "it factor?" They stand out. Do big things. Land dream collaborations. Hit big numbers and make a big impact. 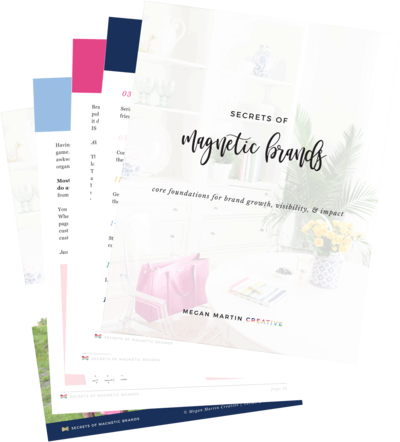 After 7 years of studying magnetic branding, effective marketing, and the science of conversion, I'm breaking down the 3 major story-building foundations of magnetic brands that can only be found here. You know me ;) Always being extra when it comes to design! But seriously, this jam packed PDF guide is intentionally designed to be both beautiful and easy-to-read. Download it. Print it. Save it! Oh snap! You'll learn what magnetic branding is, how to define brand core values that resonate, how to outline a rock solid unique value proposition, and the one rule you need to stick to for compelling brand messaging! With the guide, you'll also get access to The Ultimate Guide to Your Ideal Customer, a 5 Page Workbook that will never leave you guessing on how to connect with your ideal customer or what to say to make the sale again! The secret of what makes a brand magnetic to captivate audiences, do big things, & make an impact. How to define brand core values & set your biz apart from the competition with a unique value proposition. The exact questions I ask my custom clients to create a compelling brand messaging strategy that converts... and more!